What are the USP of Dabur baby & it’s Products? Dabur Baby as a Brand focuses exclusively on products developed using natural ingredients, which are safe and provide nourishment to babies. These products have been created through extensive research by understanding the essential need for babies tenderly skin and hair. Dabur has gone a step ahead- and ensure you the safe practices are being utilized in designing these products. Dabur Baby does not encourage the use of any form of artificial colours, paraffins, and parabens. 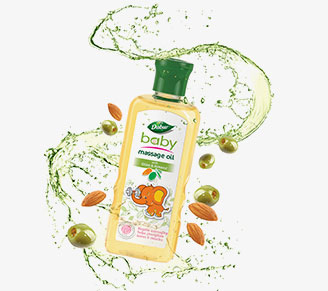 Dabur Baby Massage Oil is a unique blend of premium natural oils like - Olive & Almond which provide the baby the required nourishment. Olive is known to help provide nourishment to the baby’s skin, while Almond is known to gently moisturize your baby’s delicate skin making it soft and supple. How is Dabur Baby different from its Competitor ? which helps provide the baby the necessary nourishment. Made up of Natural oils like Almond & Olive. Provides nourishment to the Baby's skin. Almond gently moisturizes baby's delicate skin making it soft and supple. Regular massaging helps strengthen bones and muscles. Attractive and playful product pack helps engage the baby while massaging.